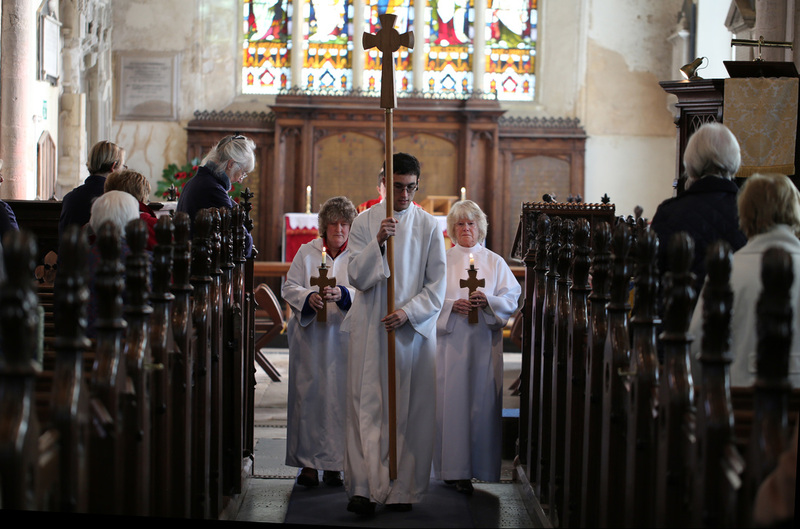 Across the Benefice we have a dedicated team of adult and children who assist in our worship by acting as servers, particularly during eucharistic services. We are always looking to encourage people to explore their calling to act as servers and to serve God in our worship in this very special way. At normal Sunday services we usually just have a single server, who carries the Cross, holds the Gospel book whilst it is being read and helps the Priest prepare the Altar for Holy Communion. On special occasions we will often have a larger team of servers, and also have acolytes (candle bearers) and (sometimes) a thurifer (incense bearer) and subdeacon (who assists the ordained ministers at the Altar). Final procession at St Andrew's Day service 2014. Reading of the Gospel at St Andrew's Day Service 2014. The Rector has appointed a head server, Mrs Trish Willis, in the Benefice, who co-ordinates our team of servers, particularly at big occasions, and also helps train new servers as they get used to their roles. Whether young or old, if you are interested in exploring serving at the Eucharist your first port of call should be to have a chat with Trish (see the ministry team on the contacts page for contact details). You can find out more, specifically, about how children can get more involved in the Eucharist here.